Paper from a big roll is first printed and then folded to create paper bags. Paper bag machines combines lot of techniques used in other cases. With the use of synchronized servo axis there is no need for gear changing. A CAM axis can cut different length products. Register mark evaluation is applied, so printed paper can be processed. 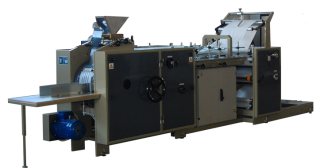 Product size changing is held in a few minutes which compared with conventional machines is very fast. This machine needs fine tuning. Machine speed is very high and paper very sensitive. Maximum production can be up to 10-11 bags/sec.